Kimberley Reflections performs Wednesday 7:30pm 21 September at the Perth Concert Hall. Tickets are available from Ticketmaster, the Perth Concert Hall box office or phone 08 9231 9999 | 9am-5pm Monday to Friday. 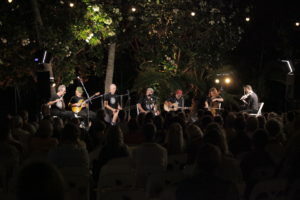 Kimberley Reflections presents five modern day songmen from ancient traditions – Gabriel Nodea (Gija man), Danny Marr (Bunuba man), Ashley Oobagooma (Worrorra man), Stephen Pigram (Yawuru man) and Mark Atkins (Yamatji man) – onstage with master musicians Erkki Veltheim (violin), Greg Sheehan (percussion), Stephen Magnusson (guitar) and Judith Hamann (cello). This extraordinary cross-cultural music program is the finale of Tura’s Reflection2 Tour across the Kimberley. 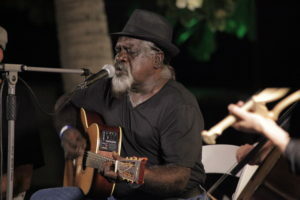 Gabriel will tell his Warmun story, Danny Marr will sing ‘Water on a Rock,’ and, in what is believed to be a first for Perth, Ashley Oobagooma will be singing about the Wandjina story with Windjana images approved by Mowanjum elders. The program also features stunning visual imagery of the landscape and the communities visited on the Tour throughout the Kimberley. A wonderful feast of contemporary, country, jazz, classical and traditional music, Kimberley Reflections also features the two newly commissioned works for the Tour, ‘Wirlburu’ and ‘Laja’, representing the six seasons of the Kimberley region. “The genius of this concert was how it used the tension between the known and the unknown to such moving and meaningful effect” – ★★★★★ Praise from the West Australian for the sold-out 2015 Reflection Regional Tour finale. “As the Tour builds to the finale in Perth I am overwhelmed with the depth of collaboration and energy that has been generated over the past 2 weeks. The connection between musicians from such hugely different musical and cultural spaces has created one of the most powerful cross cultural programs I have seen.